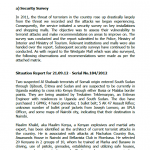 A document containing approximately two dozen situation briefings reportedly produced by Kenya’s National Intelligence Service on the threat posed to the country by al-Shabaab militants. The briefings range in date from September 21, 2012 to September 13, 2013. A coordinated and integrated StratCom approach to support NATO action in response to events in Libya is key to achieving the Alliance’s overall objective. Managing the information domain will be critical to NATO’s efforts being understood – and ultimately supported – by the audiences. It will require the use of the full range of information and communication capabilities, in line with NATO policies and authorities establishing an appropriate level of NATO visibility will be important to ensure unity of message, to manage and shape perceptions, to counter potential misinformation and to build public support. The group or individuals responsible for the attack on the Benghazi consulate remains unknown. It is also unclear if the attack was premeditated or simply a demonstration that spun out of control. Following the overthrow of Muammar Qaddafi and the ensuing civil war, Libya has been awash with small arms and light weapons. The use of such arms at the demonstration does not necessarily indicate a pre-meditated, coordinated attack. Online jihadi groups have claimed the attack was due to a statement released by al-Qa’ida leader Ayman al-Zawahiri regarding the earlier death of another al-Qa’ida leader, Abu Yahya al-Libi. Others have suggested that the attack was pre-meditated to coincide with the 9/11 anniversary in the United States. Neither of those claims has been substantiated. Until more evidence comes out, OSAC is unable to conclude whether this was a pre-meditated, planned, and coordinated assault on the Consulate. Al-Shabaab, an al-Qaida ally, relies on a broad range of funding sources to support its terrorist and paramilitary operations in Somalia. However, little comprehensive information is available on the character and extent of this funding network within the large communities of Somali expats in Kenya. Existing reports suggest that alternative remittance systems (ARS), especially hawaladars, are a reliable source of income for Somalis still living in Somalia. Expat family members living in Kenya rely on these systems to transfer money to their relatives in Somalia. Recent reports suggest al-Shabaab is a beneficiary of these services1. Al-Shabaab could exploit current and future hawaladar networks in Kenya to transit funds to support IED operations against US or allied humanitarian or military operations. Thus, networks of undocumented and unmonitored hawaladars within the country could pose a threat to future counterterrorism or humanitarian operations in the region. Further study of the role of ARS in Kenya in the funding of al-Shabaab operations is recommended. A leaked document from the United Nations regarding post-conflict deployment to Libya and discussing the possible continued role of NATO in military peacekeeping operations. The Sudanese Armed Forces (SAF) is a conventional armed force with a mandate to protect and to maintain internal security. It carries out its mandate mainly through ground forces, including Popular Defence Force (PDF) militia, as well as an air force and navy. The Supreme Commander of the armed forces, Lieutenant General Omar Hassan Ahmad el-Bashir, holds both the posts of National President and Commander-In Chief of the Armed Forces and People’s Defence Forces (PDF). For operational purposes he exercises this power through the Minister of Defence (currently major-general Bakri Hassan Saleh). The Minister appoints a Commander of the Armed Forces and Chief of General Staff (currently, general Abbas Arabi) who, together with five Deputy Chiefs of Staff (Operations, Intelligence, Logistics, Administration, Training and Morale), form the Committee of the Joint Chiefs of Staff or Command Group. The air force and navy are individual services under the commander-in-chief. Libyan Investment Authority Management Information Report documenting the Qaddaffi regime’s foreign investments as of June 2010. Photos of hundreds of Egyptian State Security officers, including the names of more than fifty high ranking officers. These photos were recently removed by Flickr for “copyright violations” after they were posted by protesters that recovered the information from DVDs taken from State Security headquarters. There are two functional security checkpoints along the main road between the Tunisian-Libyan border crossing at Ra’s Ajdir and the town of Abu Kammash 19km to the east, as based on an analysis or satellite imagery acquired on 3 and 5 March 201 1 Both are likely permanent locations established before the present crisis. Although there are clear indications that these checkpoints are actively controlling road traffic, there are however no associated large concentrations of either people or vehicle traffic leading to the checkpoints, strongly suggesting that these sites are NOT responsible for the drop in the number of people reaching the border at Ra ‘s Ajdir, as observed on 3 and 4 March 2011. It is possible that there are additional security checkpoints or temporary roadblocks located east of Abu Kammash which could be responsible for the reduction in traffic. UNITARJUNOSAT will continue to task and analyze additional satellite imagery along this transport corridor leading to the Tunisian border. This atlas provides baseline geographic information over Tripoli, Libya. It is produced by UNITAR/UNOSAT in support of international humanitarian assistance to the people of Libya. The atlas is created to respond to the needs of UN agencies and their partners. It is intended to provide objective geographic information and has been designed for easy printing and readability on A4 and A3 paper. United Nations Libya General Logistics Planning Map from March 3, 2011. This is a satellite-based quantitative analysis of the newly-established transitional camp for displaced peoples fleeing the conflict in Libya, located along the southern side of highway route P1, 8.5 kilometers west of the Ra’s Ajdir border crossing facility in Ben Guerdane, Tunisia. This assessment provides an estimate of the number of tent shelters erected within the camp, the average approximate tent size, and the derived potential current population capacity, as based on satellite imagery recorded on the morning of 3 March 2011. Five U.S. State Department Overseas Advisory Council Egyptian Revolution Warnings from January 26 – February 2, 2011. An Arabic manual for Egyptian protesters circulated via email and in hard copy prior to the protests on Friday January 28, 2010. As the Moroccan regime has cracked down recently on traditional media, the increased availability of high-speed Internet and Internet-enabled mobile devices has allowed Moroccans to take otherwise unreportable stories and grievances online. So far, the government has been relatively hands-off with regard to Internet content, though a few cases directly involving the royal family have resulted in arrests and trials. As social media use becomes more widespread and available within Morocco, the monarchy risks reaching a tipping point beyond which only draconian filtering would enable it to control the media message, a step it seems unlikely to take given its sensitivities regarding its international image. In the wake of Fouad Mourtada’s conviction for impersonating Prince Moulay Rachid on facebook.com, Moroccan bloggers have voiced concern that his arrest sets a precedent for repressing bloggers who were formerly allowed to flourish. In contrast to the outpouring of sentiment on the Internet, Morocco’s mainstream press has thus far displayed only limited attention to the case. Moroccan security services arrested Fouad Mourtada, 26, an IT engineer from the southeastern town of Goulmima, on 6 February for creating a facebook.com profile in the name of King Mohammed VI’s brother, Prince Moulay Rachid on 15 January. Mourtada’s defenders argued that he clearly had no malicious intent since he used his home IP address instead of a cyber cafe and also argued that he did not expect his posting to be taken seriously since there are so many false celebrity profiles on facebook.com (French President Sarkozy has 41). Nevertheless, on 22 February, Mourtada was sentenced to three years in prison and a fine of 10,000 dirhams (approximately $1,350) (helpfouad.com). Beginning with prominent French-language blogger Larbi el Hilali on 7 February, Moroccan bloggers have charged that Mourtada’s arrest and conviction portends a government crackdown on Internet free speech. The Tunisian State mobilizes various arms of the state apparatus and bureaucracy to restrict critical reportage and hobble emerging independent media, even though the government maintains that the country enjoys freedom of speech and the press. Measures the authorities employ include the seizure of journals, coverage restrictions, financial controls, imprisonment, and censorship. Such direct bureaucratic obstruction is complemented by more subtle/surreptitious methods of physical intimidation used to control the media environment and keep dissenting Tunisian voices in check. Journalists and human rights organizations continue to protest against the restrictions. The military-strategic intent is to assist the parties in CPA implementation by effectively monitoring and verifying the ceasefire and security arrangements, and by contributing to maintaining a stable and secure environment. The UNMIS military component will deploy its forces in a dynamic manner in its Area of Responsibility (AOR) comprising the ceasefire zone (CFZ), conduct robust mobile operations to monitor and verify redeployment of forces as per the ceasefire arrangements, and maintain visible UN presence in areas of potential conflict. Sudan’s Comprehensive Peace Agreement Map from the 2009 Air Force Africom Symposium. AFRICOM Combined Joint Task Force Horn of Africa Brief to the Surface Navy Association. This Joint Staff Advisory Note (JSAN) reviews Sierra Leone’s Second Poverty Reduction Strategy Paper (PRSP-H) covering the period 2009-2012, The PRSP-I1 examines achievements and lessons learned under the first PRSP, analyzes challenges and constraints in the economy, and lays out the strategic priorities for accelerating growth and reducing Poverty. Incomplete liberalization is keeping prices high. While many countries in the region have implemented reforms to promote greater competition and private sector participation in various ICT sub-sectors, incomplete liberalization in most of the region has allowed incumbent telecommunications operators to use their monopoly power to keep prices high in areas key to economic development such as international bandwidth and access to Internet. Over the past five years, the policy trend in the ICT sector has moved in one direction – that of more competition – and this i s having a significant positive impact on customers. However, a key issue which is emerging, particularly in relation to the development of backbone networks and broadband services, i s the details of market liberalization and regulation.